The atmosphere of a recently discovered Neptune-sized planet in our galaxy has been shown to contain water – a finding revealed by the Hubble and Spitzer space telescopes. The planet – called HAT-P-26b – is about the size of the gas giants Neptune and Uranus, and is orbiting another star around 450 light years away from our solar system. It was discovered in 2010 but the composition of its atmosphere remained elusive. Now, Nasa researchers have analysed transmission spectra from Hubble’s imaging spectrograph and Spitzer’s infrared array camera to conclude that the skies over HAT-P-26b are reasonably clear and have a strong water signature. Knowing this enabled the researchers to then go on to calculate HAT-P-26b’s atmospheric metallicity – a measurement of the proportion of elements heavier than hydrogen and helium that can give clues as to how a planet formed. The metallicity of HAT-P-26b was lower than would be expected for a planet of its size, suggesting the atmosphere is ‘young’ and probably formed after the main body of the planet, without much subsequent contamination from space debris or impacts. 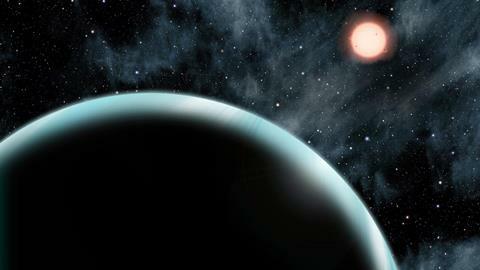 The team says the findings will help improve models of planet formation.